Local government official is seeking the approval of the Tourism Infrastructure and Enterprise Zone Authority (TIEZA) to light up the picturesque San Juanico Bridge that links Leyte and Samar Islands. Department of Tourism Regional Director Karina Rosa Tiopes said on Friday that Tourism Secretary Wanda Teo strongly endorsed the project to draw more tourists even after dark. “We are hoping that this will be materialized even next year because we will be celebrating the 45th anniversary of the completion of San Juanico Bridge this coming December 2017,” Tiopes said. Samar Governor Sharee Ann Tan shared the idea of beautifying and illuminating the iconic San Juanico Bridge to Tacloban City Mayor Cristina Romualdez, the Regional Development Council (RDC) chairperson. Presently, tourists can enjoy daytime activities at the San Juanico Bridge through the tour packages offered by private operator, Aquamomentum. “There’s just a little economic activity that we can generate from this iconic attraction at present, but when the proposal of lighting up the San Juanico Bridge is approved, we can invite more tourists to come. Local businessmen are interested to put up restaurants near the bridge,” Tiopes said. The project will use light-emitting diode (LED) which is one of today's most energy-efficient and rapidly-developing lighting technologies. 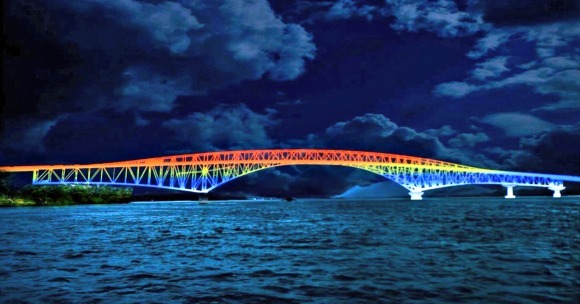 Lighting the San Juanico Bridge also comes with a presentation to attract more tourist to visit the bridge especially during weekends, according to Tiopes. “We will talk with TIEZA officials very soon and we are really optimistic that this will be pushed through,” Romualdez said when asked on the update of the plan. The mayor explained that lighting the bridge would uplift the economy of both Leyte and Samar provinces. Once called Marcos Bridge, San Juanico Bridge was built in August 1969 over San Juanico Strait, the narrowest navigational strait in the world and was completed in December 1972. It is located 10 kilometers away from the city’s downtown and 96 kilometers away from Catbalogan City, the capital of Samar province. One of its end is in Cabalawan village of Tacloban while the other end is the town of Sta. Rita, Samar.